For this, indeed, is the true source of our ignorance—the fact that our knowledge can only be finite, while our ignorance must necessarily be infinite. There are uncertain truths — even true statements that we may take to be false — but there are no uncertain certainties. My thesis is that what we call 'science' is differentiated from the older myths not by being something distinct from a myth, but by being accompanied by a second-order tradition-that of critically discussing the myth.... In a certain sense, science is myth-making just as religion is. A system such as classical mechanics may be 'scientific' to any degree you like; but those who uphold it dogmatically - believing, perhaps, that it is their business to defend such a successful system against criticism as long as it is not conclusively disproved - are adopting the very reverse of that critical attitude which in my view is the proper one for the scientist. The old scientific ideal of episteme - of absolutely certain, demonstrable knowledge - has proved to be an idol. The demand for scientific objectivity makes it inevitable that every scientific statement must remain tentative for ever. There can be no ultimate statements in science: there can be no statements in science which can not be tested, and therefore none which cannot in principle be refuted, by falsifying some of the conclusions which can be deduced from them. Never let yourself be goaded into taking seriously problems about words and their meanings. What must be taken seriously are questions of fact, and assertions about facts: theories and hypotheses; the problems they solve; and the problems they raise. 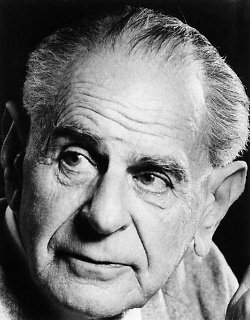 Bio: Sir Karl Raimund Popper was an Austrian-British philosopher and professor. He is generally regarded as one of the greatest philosophers of science of the 20th century.